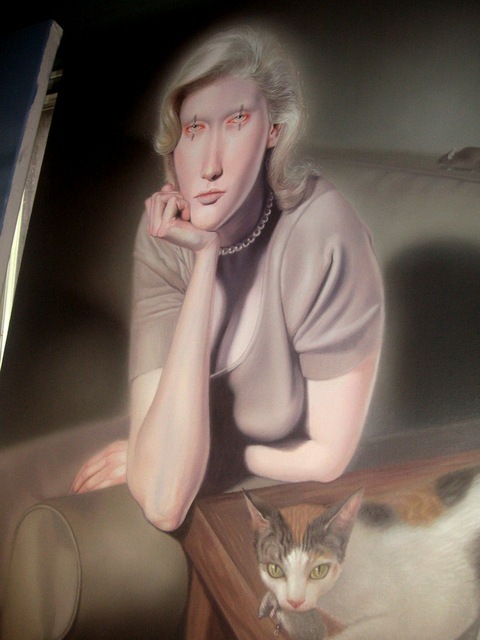 Troy Brooks has been working away in his log cabin on a secretive new series and has started a blog to keep us updated! Keep an eye out for new work at our Summer Salon show hosted by the First Canadian Place Event Space, and his Solo show this fall. "Last night at 3:30 A.M. I woke up to the low whooping sound of bird wings close to my head. I leaned over to turn on the light, but I had unplugged the lamp to make room for the fan so I could sleep in the sweltering heat. I felt my way to the door in the pitch black with this unidentified animal darting around. I turned the light on and there, flapping lazily around the tiny room in low sweeps was a fat and fuzzy bat. I woke up pretty fast, tripping over myself to open the door. I kept my head down and tried to get out with a piece of clothing. Who needs coffee when you can wake up in a bat cave. I was flapping my arms waving a pillow over my head hoping it wouldn't fly into my face or touch me in any way. Not my manliest moment.